The idea being that the black and white are predominant and the added colour is subtle. How does that roll with you? This is how I rolled!! A warm welcome to Katina, thank you for choosing to follow me. absolutely beautiful and so very elegant, val!! So beautiful and elegant CAS design! 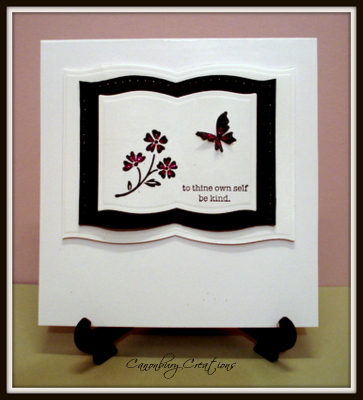 Love your use of your labels die Val...a fabulous CAS card. Beautiful CAS-card Valerie!! I'm a big fan of that kind of cards! Beautiful and elegant, love those labels. Wow how elegant, so simple, so effective! Gorgeous and very elegant Val. That is gorgeous, Val! Simply elegant with a twinkle! A classy and elegant card!